“The most original Christmas play I’ve ever attended! 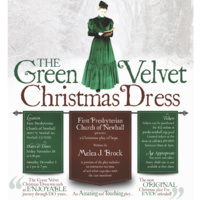 An Amazing and Touching play.” The First Presbyterian Church of Newhall will be performing “The Green Velvet Christmas Dress.” This original play, written by Melea J. Brock, chronicles the 130 year journey of a very special dress. The play delivers a most amazing and touching story of hope. A portion of the play includes an interactive teatime of red velvet cupcakes with the cast members! Save the dates - performances are Friday, November 30 at 6:30 pm and Saturday, December 1 at 2 pm and 7pm. All proceeds will go to support Stephen Ministry, a one-to-one lay caring ministry. just south of the DMV at 24317 Newhall Ave. Parking in rear from 8th Ave.